When you hear "radar", you probably think of weather radar and a policeman writing a ticket. In reality there are many kinds of radar used for everything from detecting when to open automatic doors at shops to imaging cracks in concrete foundations. I've always found radar and radar data fascinating. Some time back I saw Dr. Gregory Charvat modify an old police radar on YouTube and look at the resulting signal. 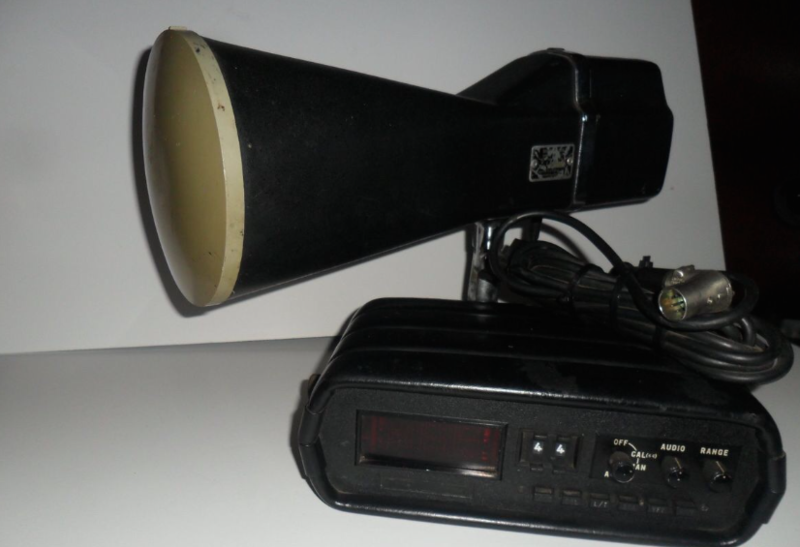 I happened to see that model of radar (a 1970's Kustom Electronics) go by on EBay and managed to buy it. I'm going to present several experiments with the radar over a few posts. If you want to learn more about radar and the different types of radar I highly recommend Dr. Charvat's book Small and Short-Range Radar Systems. I haven't bought a personal copy yet, but did manage to read a few chapters of a borrowed copy. The doppler radar I purchased. I'm not using the head unit. The radar I have outputs the doppler shift of a signal that is transmitted, reflected, and received. Doppler is familiar to all of us as we hear the tone of a train horn or ambulance change as it rushes past us. Since there is relative motion of the transmitter (horn) and receiver (your ears), there is a shift in received frequency. Let's say that the source emits sound at a constant number of cycles per second (frequency). Now let's suppose that the distance between you and the source begins to close quickly as you move towards each other. The apparent frequency will go up because the source is closer to you each emitted cycle and you are closer to the source! This particular radar transmits a signal at a frequency of 10.25 GHz. This outgoing signal is continually transmitted and reflected/scattered off of objects in the environment. If the object isn't moving, the signal returns to the radar at 10.25 GHz. If the object is moving, the signal experiences a doppler shift and the returned frequency is higher or lower than 10.25 GHz (depending on the direction of travel). This particular radar can be easily hacked and we can record the doppler frequency out of a device called a mixer. The way this unit is designed, we can't tell if the frequency went up or down, just how much it changed. This means we don't know if the targets (cars) are coming or going, just how fast they are traveling. Maybe in a future set of posts, we'll build a more complex radar system such as the MIT Cantenna Radar. Be sure to comment if that's something you are interested in. Since we'll be measuring speeds that are "slow" compared to the speed of light, we can ignore relativistic effects and calculate the speed of the object knowing the frequency change from the mixer, and the frequency of the radar. I took the radar out to the street and recorded several minutes of traffic going by, including city busses. 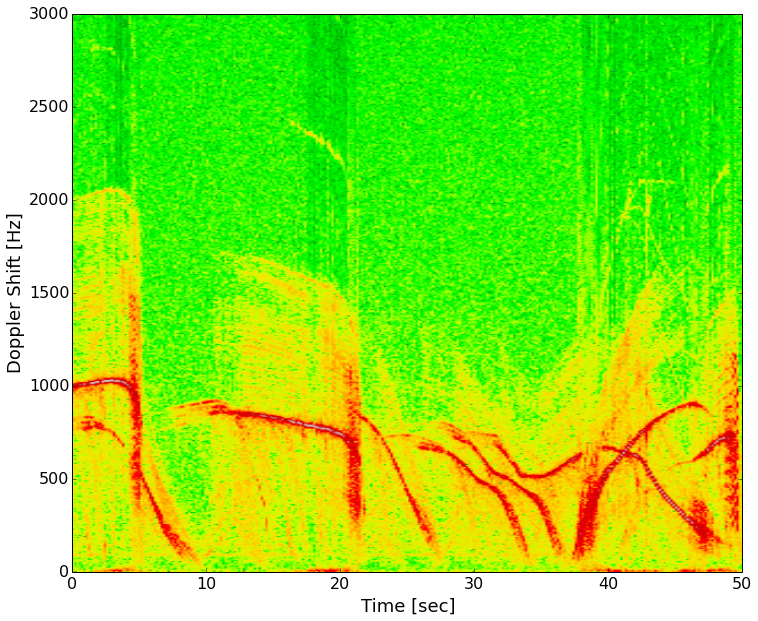 Making a plot of the data with time increasing as you travel left to right and doppler frequency (speed) increasing bottom to top, we get what's known as a spectrogram. Color represents the intensity of the signal at a given frequency at a certain point in time. Speeds of several cars on my street. 1000 Hz is about 33 mph and 500 Hz is about 16 mph. The red lines are strong reflectors (the cars). Most of the vehicles slow down and turn on a side street in front of the radar. About 30 seconds in there are three vehicles, two slow down and turn, the third again accelerates on past. Next I'll be lining up a video of these cars passing the radar with the data and you'll be able to hear the doppler signal. To do that I'm learning how to use a video processing package (OpenCV) with Python. In the next few installments, we'll look at videos synced with these data, radar signatures of people running, how radar works when used from a moving car, and any other good targets that you suggest! 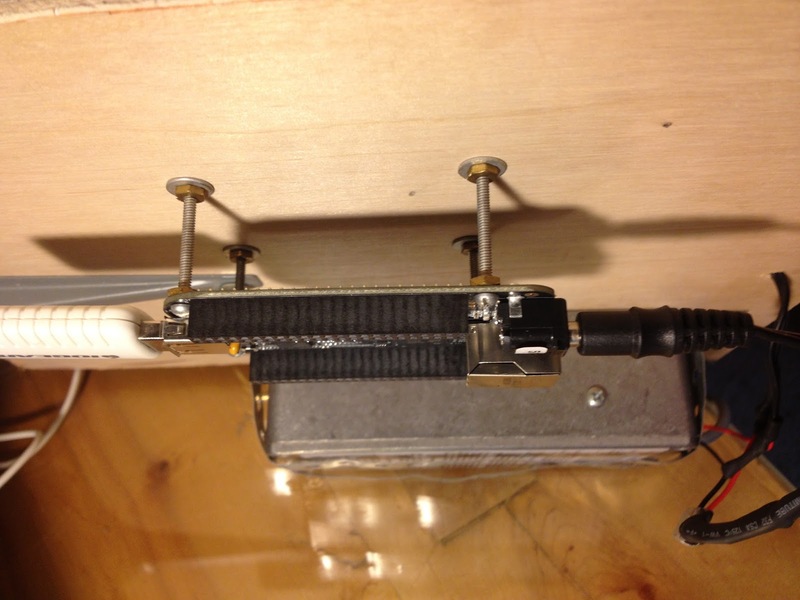 Awhile back I saw a post from the folks at the MIT Media Lab on a little creation they called the "drawdio" (here). This looked like a fun little project! It's an oscillator based on the classic 555 timer integrated circuit, but with a twist. The twist is that you can control the frequency of the oscillation (tone of the note played by a speaker) by varying the resistance between two contacts. These contacts seem to commonly be a pencil lead and your body, but as the MIT website demonstrates, almost anything can be used. I decided it was time to build one of these, so I headed over the MAKE to get the plans. I already had most of the parts (or good substitutes) on hand. The battery holder and enclosure would have to come later. 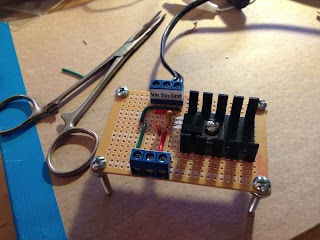 I built the circuit with simple point-to-point wiring on perforated board. The speaker is a salvaged part from a fax machine! I plugged the power supply in a touched the signal wires together. The speaker let out a shrill tone and we were in business. The next challenge was figuring out a case a final setup for the device. I wanted this to be durable since lots of people at work and home would be playing with it. The solution ended up being hot glue and a plastic crayon case. I drilled holes in the case above the speaker for sound and added a power switch. The final touch was terminal posts for the sense wires that control the pitch. To make the sensor I just wrapped bare wire around a pencil body for one contact and inserted a push pin into the lead at the top for a second contact. The goal is to complete that circuit and change the resistance between the two contacts. The easiest way is to draw a graphite track on paper and make the circuit through your hands. See the demo video below. 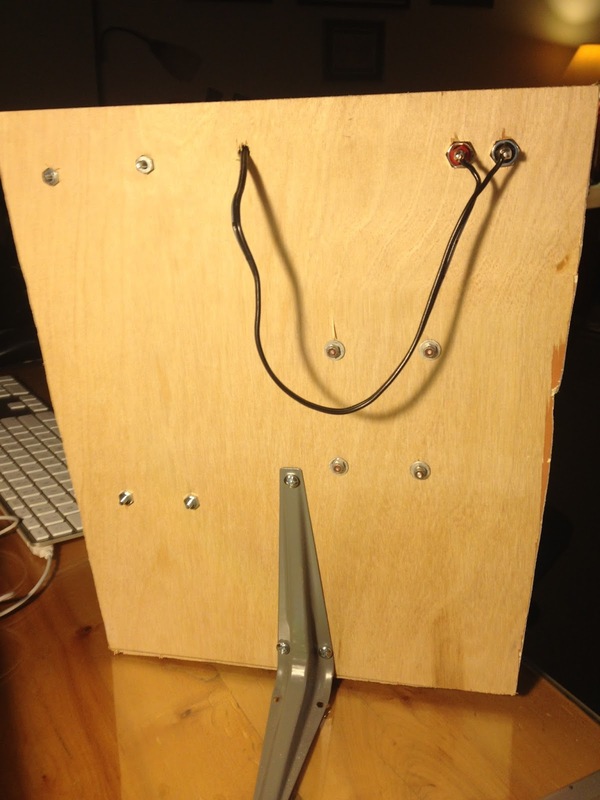 I'd like to write a short series of posts describing my setup of the infrasound unit I've written about before. This is the same unit we used to look at traveling acoustic energy from the Russian meteorite and will soon use to examine earthquakes! Placing the unit inside my office or even inside the apartment proved to be very noisy as I saw every time someone opened or closed a door! The makers (Infiltec) suggested that I put it outside, maybe in a drink cooler to shield it from the weather. I did exactly that (photos below), but the cooler turned out to not be water proof and had about 2 cm water standing in the bottom when I checked it after a small storm. The data quality while the instrument was outside was amazing though, with seismic signals coming through very clearly. 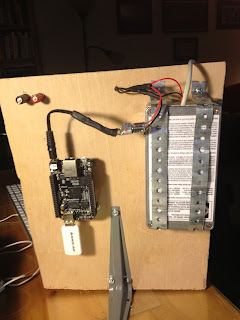 It was time to design a new system that would: 1) Be safe to leave outside in the weather, 2) Not have thick data cables running inside to a computer, 3) Would not require an inside computer, and 4) Would automatically post the current data online. For the first post we're going to talk about the casing setup and mounting of all the vital hardware. 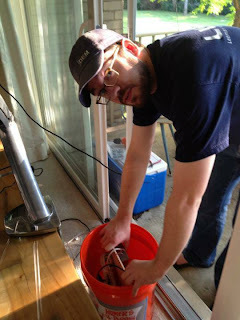 One weekend we decided to go wandering about Home Depot to find a suitable shell for the instrument as well as pickup a few other essential supplies. Lendi had the flash of inspiration that we should use a 5-gallon plastic bucket... the ones at the Home Depot "Homer's All Purpose Bucket" even have an O-ring seal on the lid. Perfect. 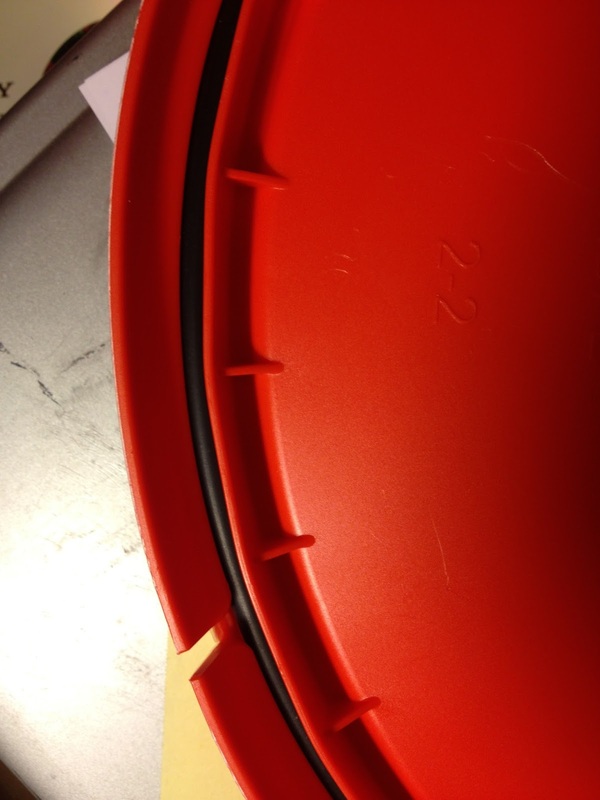 A built in O-ring seal on the bucket. Now to figure out how to hold the hardware up off the bottom of the bucket. In an ideal world this isn't needed, but in reality water may get in and I don't want it covering electronics thrown in the bottom of the bucket. We used 1/4" plywood cut to a keystone shape that just fits the vertical profile of the bucket. Adding two "L" brackets from the shelving section meant for ~$15 we had the shell and left over plywood. Test fitting the plywood into the bucket. Notice the cooler in the background that formerly housed the instrument. I bolted the infrasound unit to the wood by using "plumber's tape" or metal strap with holes down its length. This isn't the most elegant solution, but it meant no drilling the infrasound case which is semi-sealed on its own. It is also very easy to get the unit out for any maintenance. My RaspberryPi ended up having problems on the circuit board, so I've bolted a Beagle Bone Black to the board as well. Front of the mounting board. 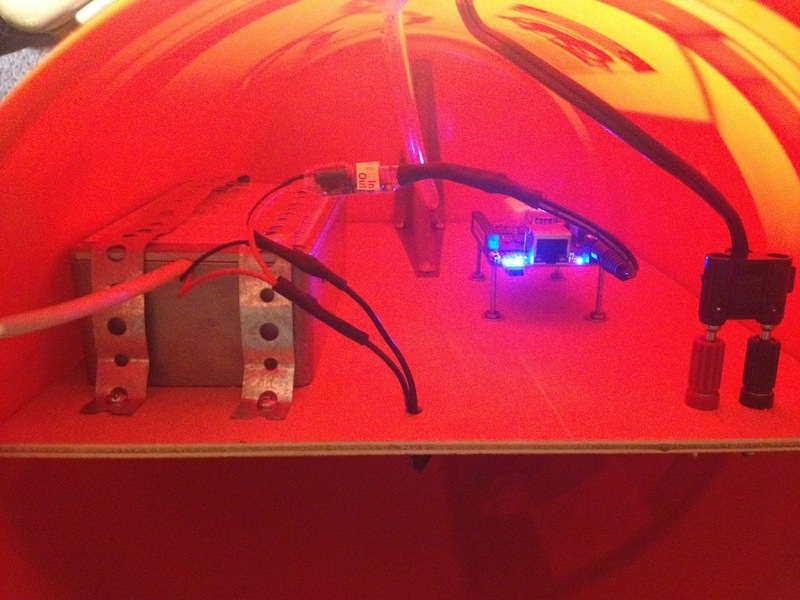 Infrasound unit (right), Beagle Bone (left), and power plugs (top left). Rear of the mounting board with power passthrough. With no tall standoffs handy I made use of locking nuts, washers, and other assorted 4-40 hardware. Two holes were drilled in the side of the bucket: one for the power and one for the air tube to the infrasound instrument. I passed the power cable through (outdoor zip cord) through as well as clear plastic tubing and sealed it with bathroom silicon sealant. I'd recommend sealing on the inside and outside of the bucket bulkhead. Make sure to leave extra cable and tube for drip loops. A drip loop like structure was fashioned on the outside of the bucket to ensure no rain would blow up the tube into the unit. 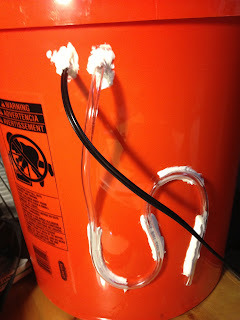 We taped the tube down and then ran beads of silicon to secure it to the bucket. After the sealant dried we moved the tape and secured the rest of the tubing. 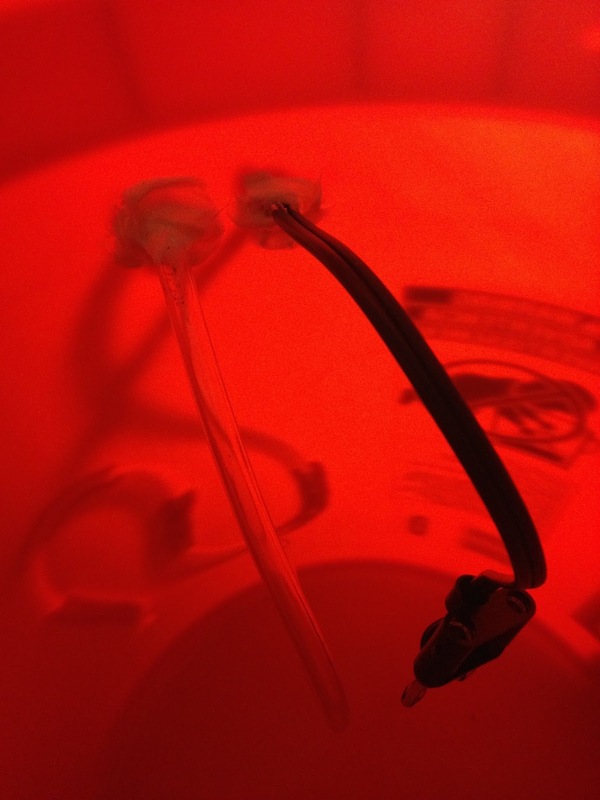 Power and air tube sealed into the bucket and loops to prevent water flow. Inside the bucket: notice the power plug. In later posts we'll talk about how the power is actually provided and such, but the part that pertains to the hardware is the mounting of two binding posts on the plywood at the standard 3/4" spacing. This allows us to power the board from a banana jack on the bench for testing or operationally in the bucket. I drilled a passthrough hole to send power from the back of the jacks to the front of the panel. Initially I built a 5V regulator to power the computer with from an LM7805 linear voltage regulator, but this was indeed a poor choice. Even with a decent heat sink, the chip still got blistering hot when I was drawing 700mA (of the 1000mA rated power). Considering this would be outside in the summer heat and the fact that I didn't want the failure point of a mechanical fan I decided to use a buck voltage converter. Linear regulators dissipate all extra power as heat. For example: I was feeding 12VDC to the converter with a 700mA load running at 5VDC. That means that (12V-5V)*0.7 = 4.9 Watts of power was being turned into waste heat! No wonder, remember we think of watts as energy/time (Joules/second actually). That's a lot of wasted electricity and really just a complication to our design, but it was very clean power. The old linear regulator. It's now awaiting a new use in the parts bin. 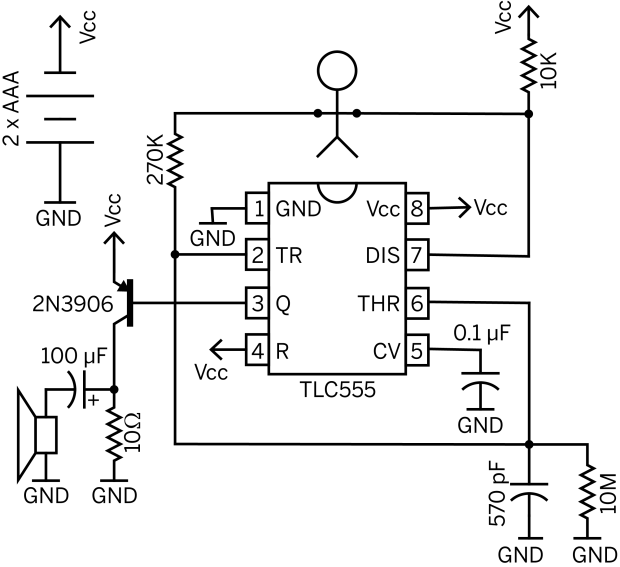 The buck converter is a switching type regulator. I don't want to get into how switching regulators work current, but it's an interesting topic and you should have a read on the theory if you like. I bought a small unit (P/N 1385) from Adafruit that is rated to 3A (though it gets warm there). The power isn't quite as clean from this switching supply, but it's fine for out use here. It works great with the Beagle Bone and provides lots of extra power for 5V accessories. Don't want to order and ship from Adafruit? You can get the exact same thing from a model shop. 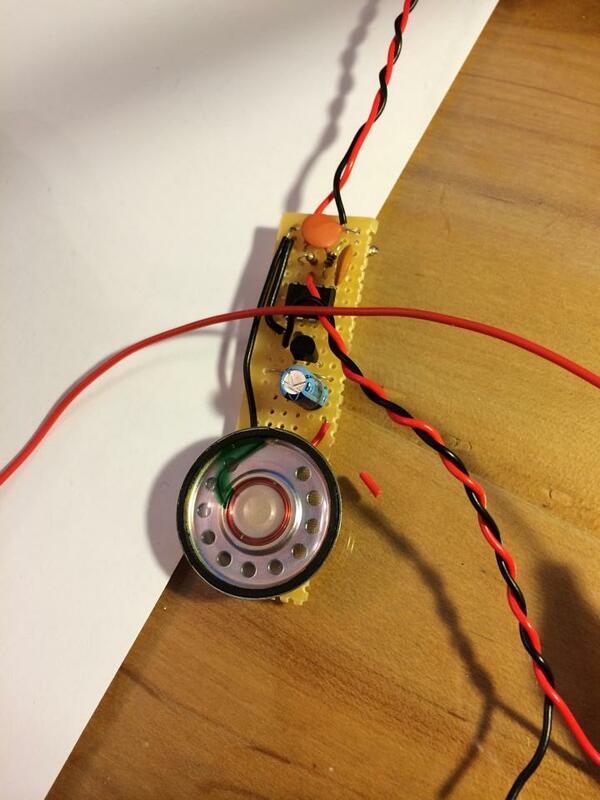 They are called "battery eliminator circuits" and allow modelers to plug their airplane, car, etc servo electronics (5VDC operation) into a 12V battery they already have in their kit. Just clip the 3 pin servo plug off the end and you are ready to go. 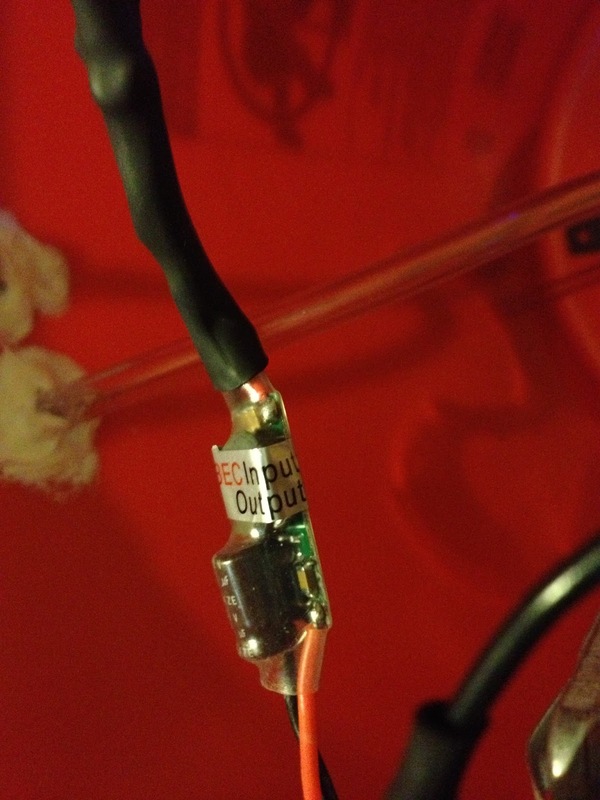 Don't forget good soldering practice and to use heatshrink tube! Shorts could spark a fire, which we don't want. The "battery eliminator circuit" or my 5V buck converter to supply 5VDC to the Beagle Bone. So there it is! Next time I'm going to talk about setting up the power and network infrastructure. Maybe even the serial communications! We're going to try to avoid using a serial-USB converter since the Bagle Bone has only one USB port (that I'm using for a WiFi adapter), I don't want to use a hub, and it's a chance to learn about signal level shifting and wire into that temping header on the board. Everything fit into the bucket nicely and powers up from the bench power supply. Per lots of emails and requests I’m going to post what I have from the design of the fluxgate magnetometer mentioned in several previous posts (like this one). The schematic attached at the bottom is a rough draft, but should provide some guidelines for designing and building a version of this instrument. I’ve also attached links to several PDFs that I found very helpful when building this demo. It should be noted that this design doesn’t have a plain readout with XXXXXX nT magnetic field, but displays a waveform on the oscilloscope. Could one be made? Absolutely! Since this was more of a demonstration of the underlying physics I didn’t bother, but it would be a good weekend project. - Use shielded lead wires to reduce crosstalk to the coil. - Use a simple Analog-to-Digital converter so this output is projected from a laptop to the classroom screen (much easier than gathering students around an oscilloscope). I think an Arduino might do the trick. Raspberry Pi would be a good choice too. - Add gain adjustment knobs to the control panel. - I would again use the Velleman kit for the signal generator instead of re-designing the wheel. When using this in the classroom I laid it alongside commercial magnetometers on the table. We discussed the physical principles behind the instrument, and then students would use the demo fluxgate to generate an output wave. Afterwards we used the commercial magnetometers to do simple tasks like finding conduits and keys. It would also be nice to have a first-principles proton-precession magnetometer. There is a book “Signals from the Subatomic World: How to Build a Proton PrecessionMagnetometer” that describes one such instrument, but significant improvements in the instrument could be made with modern programming languages and ADC devices. I still welcome questions on the fluxgate and will probably update the instrument next time I teach an Intro Geophysics course (undetermined). Thank you for all the interest and if you build one, please send your results and we’ll put them up here for all to benefit.